Before you can use the laser cutter you must have gone through a training session and signed a usage agreement. 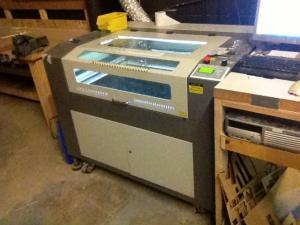 At the moment there is no cost for using the laser cutter. This will change. The laser cutter was purchased with donations from diyode members (Mark, Simon, Jamie, Tony and Dave S.), and technically is not the property of Diyode. The only extinguisher that should be used is a special CO2 extinguisher. Any other type of extinuisher will destroy most of the laser cutter's components. It is recommended that operators wear safety glasses. ANSI Z136 Safe Use of Lasers and ANSI Z136.1 for general laser safety information. Hi, the dropbox link to the laser cutter manual is broken (or disallowed) FYI. Bed is levelled. Occasional problems reported with x-axis jumping inches. Watch your work careful and report any issues.